For this week, I got number of blockers, my machine was down and we had power shortage in my home area. But however, I tried to nab a few of this week's objectives(check down here). What the module can currently do. Currently, the module can download or export Patient data in an encrypted format but depending on default configurations. This will trigger the whole process, collects all Patient data, encrypts it and a download is automatically triggered. NB:- Currectly the module supports only Patient and Location as a Resource. I think next week I will add support for other Resources. I looked through my codebase as a module, did some code cleaning and Implemented logging for debugging purposes. I refactored my Resource Services to a better implementation. I think as for now I finished with the export logic. Exporting works good, However I haven't tested it with a big dataset ☹️. Written lots of lines of code and Utility methods. I expect to get done with the importing/merging logic from the UI point of view. Test whether the entire API can really merge MPD data. Need to also work on the Configuration support from the UI. I think I will use the gridJs Library at the front end for indexing, paging, validation etc.. If it doesn't challenge me, then I won't help me. I think I will be strong enough to stand all this. Looking at the lately anticipated tentative release date, I couldn't proceed with the release process when most of the tickets in the Road Map in the batch aren't fixed. Lots of the time for this week was invested in release tasks. We were very ambitious that by this week, Platform 2.2 could released! I'm only and almost done with the Data exporting logic (I mean from the UI end). I did some little work on Exception handling. To be honest, not yet implemented logging in the entire API. I don't know why I consistently forget. 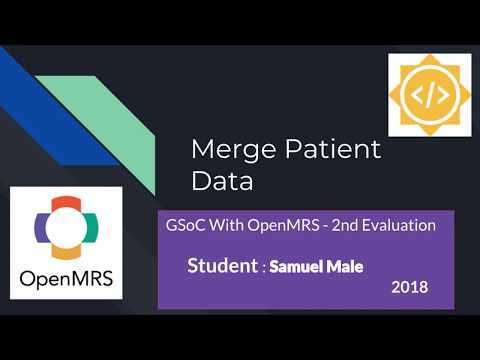 I added a mergepatientdata app link on the OpenMRS Ref app homepage. I created a mergepatientdata dash board. I'm still caught up assembling the rest of the API to actually get real life application. I started with the Export fuctionality. In week five, we need to do the first program evaluation with Google. So I'm gonna prepare myself. I anticipate doing it tommorow(Monday). I need to make sure the module really gives a basic functionality. At least covering 58% of the project objectives. Thanks for keeping track and getting concerned with this project development. Week three has been sort of challenging but lots of work has been done. More work has been done on the API of the module. I started work capitalizing on a Patient as the main Resource. Later, I will work on the rest of the Resources like Location, OBs etc. I completed work on the PatietResourceService . I created an MPDClient . This contains all the logic of importing and exporting data. I started with the exporting part of it. Done some partial implementation of the Configuration domain. I introduced an Export Service and Encryption Service . And lots of new Methods introduced in the Utility layer . This client will abstract us from all the logic of exporting and importing data. It simply uses a given configuration, collect the required data from the database, serialize it to a file and then encrypt the file and possibly return an Audit message. It accomplishes all this by delegating the concerned Services that are currently partly implemented. I expect to get done with the MPDClient(Both export and import logic). Need to work on Exception handling of the entire API. Need to work on logging in the entire API. Need to work on the UI. Implement a module page on the RefApp. The module should be able to export and import data. I'm gonna do some release task since I'm the OpenMRS Release Manager for platform 2.